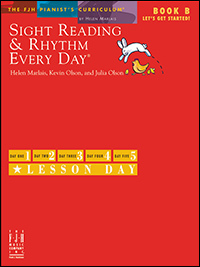 Fun subject matter, fanciful lyrics and happy illustrations motivate students to practice their sight reading every day! Fun in the Sun, At the Farm, and Weather Watching are some of the engaging themes presented in the seven units. Interval recognition includes 2nds, 3rds, 4ths, and 5ths from Guide Notes Middle C, Treble C, and Bass C. These carefully crafted exercises develop eye, ear, and hand coordination where students learn to play musical examples from beginning to end without stopping. Designed to be accessible to young beginners, we've used larger fonts and added lyrics that appeal to kids. Each unit has a theme such as At the Park, Up in Space, or Creepy Crawly Things. 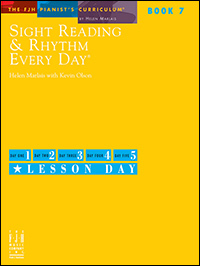 Every day the student claps/counts two short rhythm lines, and sight reads two short pieces, and checks off a Did It! box. 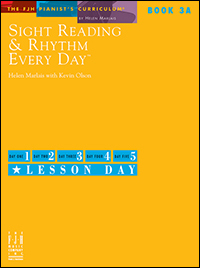 This carefully sequenced book starts with reading 2nds and 3rds from guide notes Middle C, Treble G, and Bass F; then adds the interval of a 4th in Unit 4. This new addition to the series guides students in a simple way to sight read with ease, accuracy and musicality. 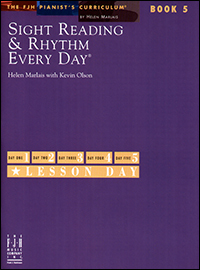 In the Every Day plan for Book 1A, students learn key and time signature recognition; how to count rhythms; interval recognition starting on the guide notes of middle C, treble G, and bass F; pattern identification; and immediate response to articulations and dynamics. In the Every Day plan for Book 1B, students learn key and time signature recognition; how to count basic rhythms in time signatures of 2/4, 3/4, and 4/4; interval recognition starting on and around the guide notes of middle C, treble G, treble C, and bass C; pattern identification; and immediate response to articulations and dynamics. 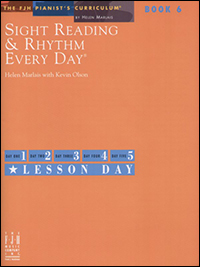 In the Every Day plan for Book 2A, students learn key and time signature recognition; how to count basic rhythms that include eighth notes; interval and pattern recognition through major five-finger patterns; single-line music played between the hands; immediate response to articulations; dynamics; and beginning transposition. In the Every Day plan for Book 2B, students learn triads and begin to play pieces with both hands together on two staffs. Attention is given to different articulations and dynamics, and students are asked to transpose short pieces to the nearest keys. In addition, students learn to "plan" for note and rhythmic accuracy, correct articulations, and a good sound. Helpful suggestions guide students to think before they play, and not to stop once they have started. Students are also asked to count rhythmic examples out loud and clap, tap, point, snap their fingers, and march. Developing these important skills lays the proper foundation for music making and fosters stellar piano playing. 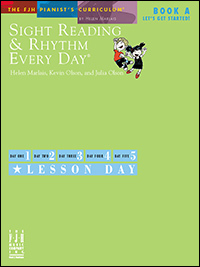 In the Every Day plan for Book 3A, students learn and practice different rhythmic activities with accent markings, focusing on the dotted quarter note rhythm followed by eighth notes. Tonic and dominant chords are explored, as well as melodic and harmonic intervals of major and minor 2nds and 3rds, and perfect 4ths and 5ths. Extending the usual five-finger pattern by crossing the second finger over the thumb is taught, as well as learning transposition of up to a fifth interval. Students will develop important skills such as eye, ear, and hand coordination through carefully crafted exercises, and will help turn your students into young artists. In Book 3B of this distinctive series, new concepts carefully interweave with reviewed concepts to further the students’ knowledge and hone their sight-reading abilities. Some of the concepts reviewed are: rhythms that include dotted quarter notes followed by eighth notes, crossovers of the second finger over the thumb extending the five finger pattern, and a review of tonic and dominant chords to name a few. New concepts are introduced, such as how to count triplets, play and recognize Sus4 (suspended fourth) chords, play and recognize authentic cadences, and expanding knowledge of intervals to include M2, m2, M3, m3, P4, and P5. Students will also play in the keys of B flat major and B minor. In Book 4A of this outstanding series, Helen Marlais along with Kevin Olson, provide students with creative, structured lessons and activities to further develop their sight reading abilities. New concepts include: sliding the thumb under the third finger; reading intervals that include ledger lines; the beginning of playing one octave scales; further study of intervals, cadences, chord progressions, and keys; to name a few. In Book 4B of this outstanding series, Helen Marlais along with Kevin Olson, provide students with creative and structured lessons to further develop their sight reading and rhythm abilities. New concepts include: reading chord symbols; reading intervals that include ledger lines; the beginning of playing one octave scales; further study of intervals, cadences, chord progressions, and keys; to name a few. 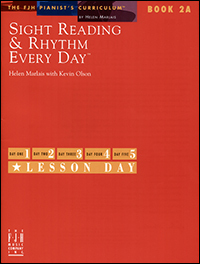 In Book 5 of the Sight Reading & Rhythm Every Day® series, students learn about compound meters and cut time, chords and their inversions, and new music terms including dolce, meno, and sempre. 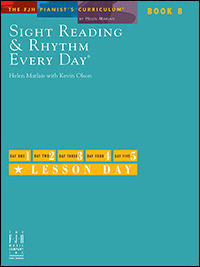 Also, Book 5 incorporates Rhythm Flashes!, Interval Flashes!, and Pattern Flashes!, which are designed to help students think and plan quickly for excellent sight reading! 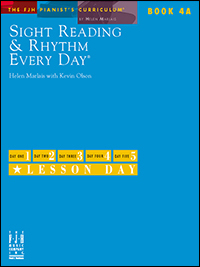 Original pieces and teacher/student duets along with a carefully sequenced curriculum make learning to sight read an engaging activity for developing students. 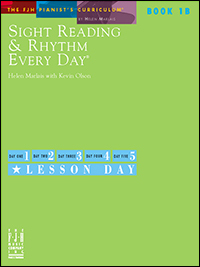 Book 7 continues to develop student’s ability to sight read with ease, accuracy and musicality! Carefully crafted musical examples develop eye, ear, and hand coordination. New concepts are: sixteenth-note rhythms in 3/8 and 6/8 meter and three part chorales. Reviewed concepts: relative major/minor keys, reading ledger lines, diminished chords and augmented chords. Daily activities with “DID IT!” boxes save valuable lesson time. Book 8, the last book in the series, features challenging rhythms that occur in early advanced/advanced music such as 3 vs 2 and 2 vs 3. Students read pieces with two-octave scales, ledger lines, syncopation and counterpoint in many different keys. Transposing and harmonizing skills are reinforced. The student is always encouraged to plan before starting, and to play accurately with correct articulations and good sound.